FRONT PANEL USB HUB (front usb): Easy front connection for USB WebCam, USB Digital Camera, USB MP3 Player, USB Joystick, USB Printer, USB Mouse and many other USB devices. FRONT PANEL USB 2.0 HUB (front usb 2.0): Easy front connection for high speed USB devices, e.g. external HardDisc and DVD-RW. FRONT PANEL IEEE 1394 HUB (front firewire): Easy front connection for Firewire HardDisc, Firewire CamCorder and Firewire CD-RW. FRONT PANEL SERIAL CONNECTOR (front serial): Easy front connection for Digital Camera, Palm Computer and Modem. FRONT PANEL MULTIMEDIA CONNECTORS (front multimedia): Easy front connection for Microphone, Headphone, Joystick, VCR and multimedia devices. Are you frustrated with the difficulty of reaching those pesky ports and connectors behind your computer? The problem is obvious, especially at home, where the computer tower is commonly placed against the wall or under the table. Your workstation will be more organized with fewer peripherals connected, which means more working space, and less tangle of cables at the back of your computer system. Now, you can move your PC with ease!! FRONT PANEL FIREWIRE (front IEEE 1394): You do not have to install a DVD-RW on every PC's you own. With the IEEE 1394 port placed on the front, one IEEE 1394 DVD-RW can be "shared" by all PC's. 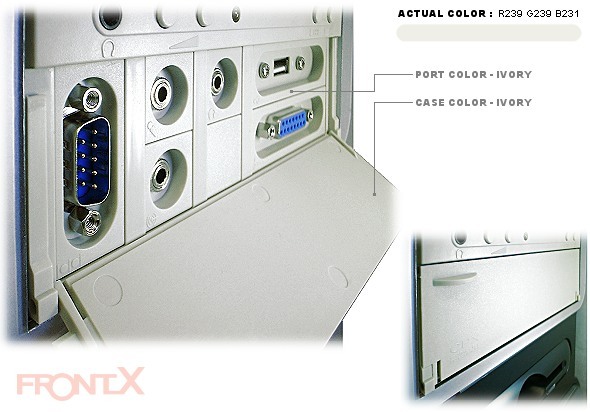 FRONTX Headphone Port comes with a speaker socket to be fixed at the back of the PC case (using the Metal Plate / PCI L-bracket provided). Speakers are plugged into this socket. When headphone is plugged on the front panel, the speakers are cut off. So convenient!! For 4 speakers soundcard, you can connect the 2 front speakers with FRONTX, whereas your rear speakers remained plugged on your soundcard. When the headphone is plugged, your front speakers will be automatically cut off, but you need to manually mute your rear speakers with your soundcard software. Ports currently available are; Headphone, Microphone, Audio-In, Game (midi), Serial (d-sub 9 pins), USB, Firewire (IEEE 1394a), RCA Audio, RCA Video (composite video), RCA SPDIF (digital coaxial audio), S-Video, SATA (eSATA) and PS2 (mouse or keyboard). If you don't like the flip door, it can be removed easily. All cables are UL certified and meet the specifications of respective technologies. All cables carried in our webstore are in compliance with RoHS requirement. The values and quality of FRONTX can be assured by the many awards won by the product. Let us know what do you think of our products, or our customer service. We appreciate your feedback. If you feel that FRONTX offers good values to users, please tell your friends. The product is pending International Patent. FRONTX Products were formerly named as CPX Computer Port Extension. The 5.25" FRONTX Casing has 4 port holding bays, i.e. 1 large bay and 3 small bays. The FRONTX Port is simply an extension cable fitted onto a custom designed port holder (face plate), which can be slotted into the port holding bay. It's that simple!! As the design is modular, ports are totally exchangeable, e.g. an audio port can go into any of the 3 small bays, top or bottom space. Similarly, game or usb port can go into either the top or bottom space of the large bay. The voids of the unused or partially used port holding bays are covered by slotting blank plates. 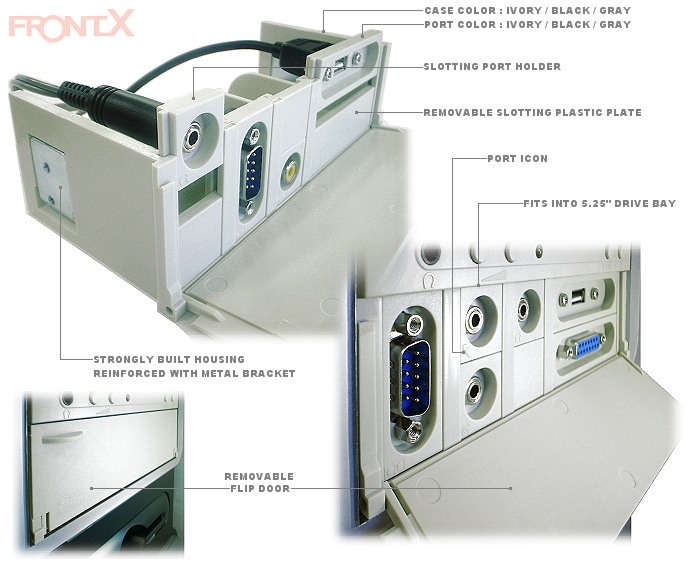 Each port holding bay can hold a maximum of 2 computer ports, which means the FRONTX Casing can hold a maximum of 8 computer ports. The external cables simply transfer the PC ports located at the back of the PC, to the 5.25" drive bay. 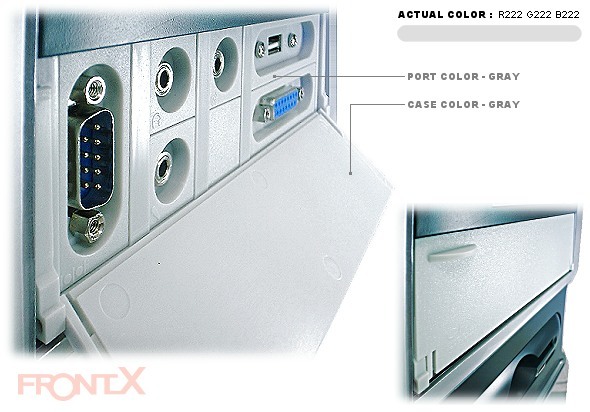 The extension cables re-enter the PC chasis through an opening of PCI/ISA slot, and the connectors are secured on the front panel with our FRONTX modular system. Please read our installation guide: installing external ports. All new motherboards provide a full range of internal port headers (USB, IEEE 1394, etc. ), supposedly to comply with the design guidelines of "Intel Front Panel I/O Connectivity". However these headers (pinouts) cannot be fully utilized due to the limitation of PC design. Not anymore. 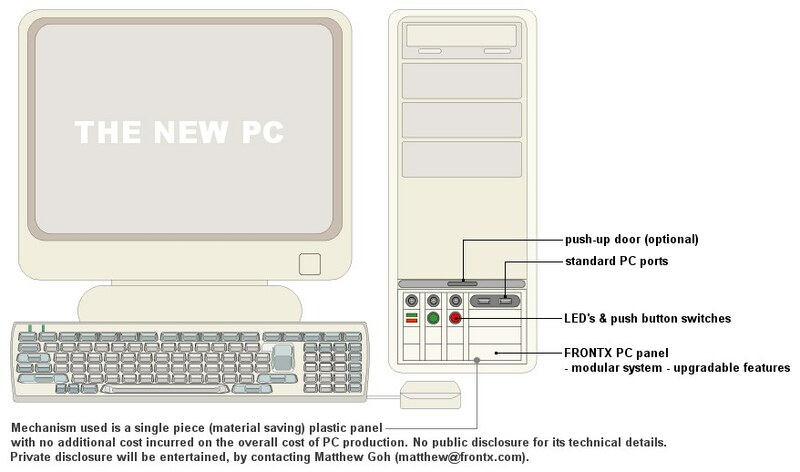 FRONTX is here to complete the missing links between the mother-board and the computer's front panel. We can humbly say that FRONTX is indeed a breakthrough in PC design!! Now you can utilize the unused USB header (pinout), FireWire header, etc. on your motherboard and bring additional communication ports to the front of your PC case at minimal cost. Please read our installation guide: installing internal ports. FRONTX is available in 3 colors, i.e. black, gray and ivory. The color buttons above represent its actual product colors. LONG TERM SOLUTION - SAVE!! As the product is upgradeable, any worn-out or damage of port can be replaced easily, without the need to replace the entire product, or the whole PC case. Not sure what your needs are in the future? No worries, you are free to recustomize your ports configuration anytime. FRONTX can accomodate any new port invented in the future (USB 3.0?). 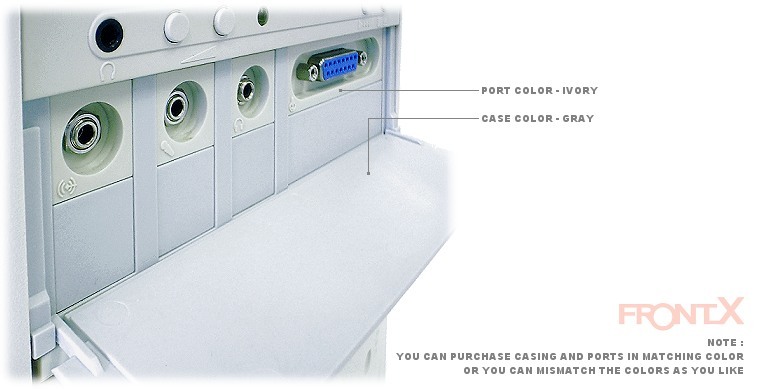 No high cost incurred, since you do not have to replace the entire product, or the whole PC case. Unwanted FRONTX Port can be used as extension cable. Just remove the port holder from the cable and you get a 3 feet extension cable..... or you can use it for do it yourself front ports installation. Make your own ports selection now. Purchase one FRONTX Casing plus the ports of your choice - external or internal, or a combination of both. Alternatively, you can purchase a packaged multimedia ports (described below). You can also purchase additional ports to add to this package. FRONTX MULTIMEDIA PORTS come with FRONTX Casing and a package of soundcard ports which include game, headphone, microphone and audio-in ports. 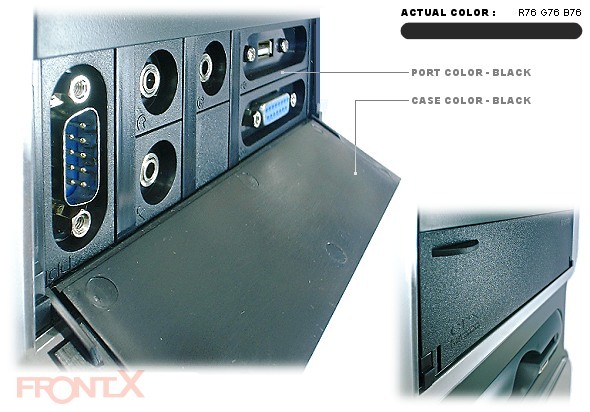 You will quickly see how convenient it is to have these ports mounted on the front side of your CPU tower / PC case. Plugging in your headphone cuts off the speakers' operation -- you never have to crawl to the messy ports at the back of your computer case / PC case. The front mounted headphone jack works just like a hi-fi system. Speakers can be permanently connected to the back, while the handy headphone socket at the front is ready when you need it. With the game port placed on the front panel of the computer case, the gaming device can be easily connected when needed. You no longer need to waste desk space with rear connected joysticks. And because swapping of game control devices is made so easy, you can plug in the appropriate device (e.g. game pad or joystick) to suit your various games. The front loaded or front accessed audio-in jack is convenient for sound input and sound recording. You can now make your own MP3 recordings with ease. This port is seldom utilized by most users because it is hard to reach. The convenience of front mounted microphone jack is obvious. But don't forget, the placing of the headphone and microphone jacks adjacent to each other allows for easy connection of your headset. 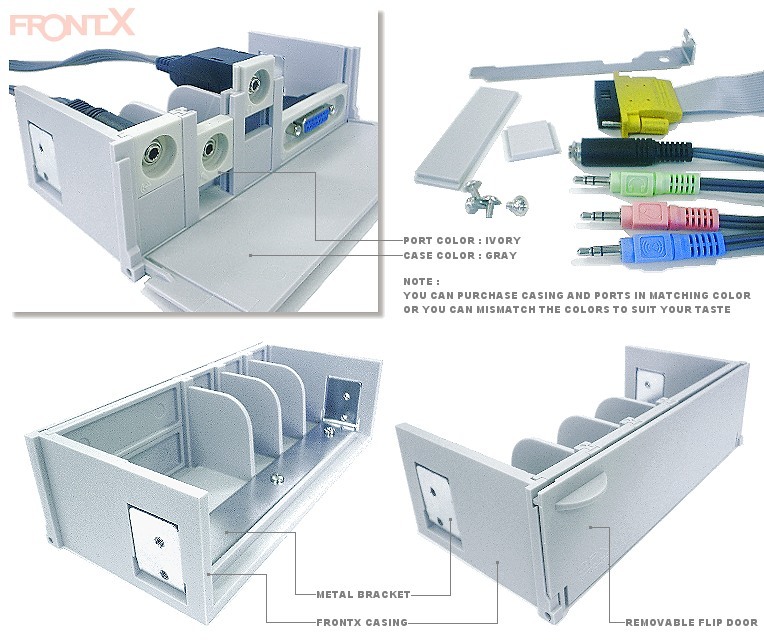 Simply install FRONTX Casing into a 5.25" drive bay, let all the cables pass inside the PC case, and exit through a PCI/ISA opening. Plug the connectors into the relevant ports at the back of the PC. Use the Metal Plate provided to cover the gap of the PCI/ISA opening. That's it!! NOTE - you can install a configuration which combines both external and internal ports. FRONTX is a registered trademark owned by Frontx CPX Sdn. Bhd.